TGIF. Seriously, it has been some week. Although I have been smart enough not to fortify myself with a dual dose of energy drinks again, the general pace of my week has not let up at all ever since Monday. I'm not usually much of a drinker, but if ever there was a week to unwind with a glass in hand on Friday night, this was it. Courtney is out of town for a wedding, and won't be back until tomorrow night, so it's just me and the kids tonight. Time to tuck them in and break out the hooch. Special occasions call for special beverages, and honestly, what occasion is more special than the conclusion of Project Gastronome's Potables Week? I didn't even drink at my own wedding. For my silly little blog project, though? Hells yeah. You may remember that at the very beginning of Project Gastronome, I mentioned drawing inspiration from the very funny "Steve, Don't Eat It!" series at The Sneeze. In what is perhaps his funniest entry, he homebrews his own prison wine. 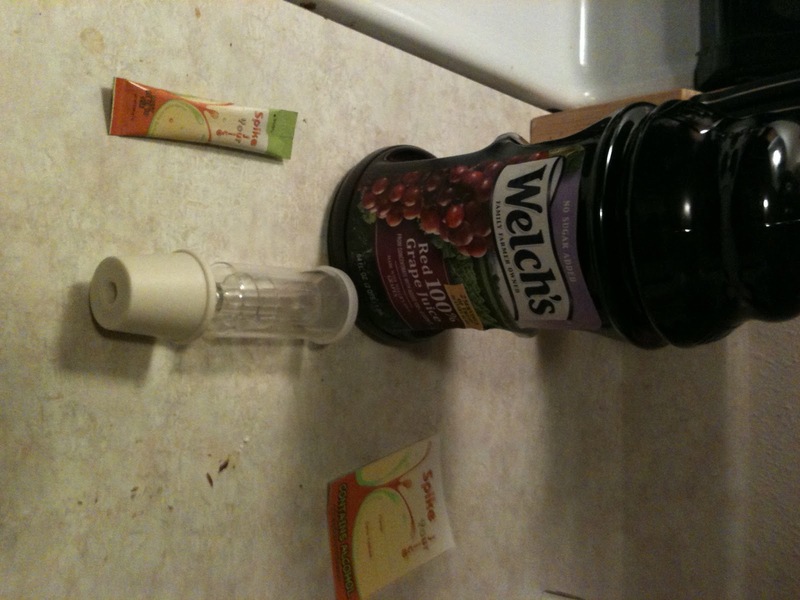 Click the link and see, but when I say he homebrewed it, I mean he took actual ingredients that a prison inmate may have (trash bags, moldy bread, fruit drink, etc.) and homebrewed his own prison wine. I seriously admire his dedication on this one. It would never work in my house. Jack would find those trashbags full of Chateau d'Alcatraz in about two minutes and rip them to shreds. Instead, I turned again to ThinkGeek (seriously, ThinkGeek HQ - I am open to sponsorship offers), and ordered a DIY Juice to Alcohol Kit. Here's the kit contents. It contains instructions, six packets of yeast, six bottle labels, a rubber stopper, and an airlock. 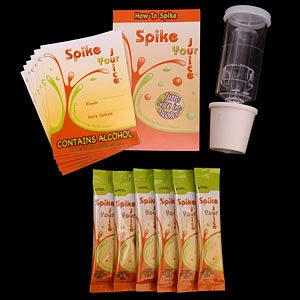 Each packet can turn a 64 ounce bottle of your favorite juice into sweet, sweet ethanol in just two days! The instruction book has a few handy recommendations for recipes you may wish to try, and different juices that work especially well. I'm a novice oenophile at best, but I've never cared all that much for white wines. I decided that you can't go wrong with the classics, so I chose a bottle of Welch's Red 100% Grape Juice and set a reminder on my calendar to start things in motion on Wednesday morning. Here is where I have to pause for a moment to wonder what my mom's reaction is going to be when she reads this entry. Last night, she and my dad met us at Blake's PTA program, and she gave me a good scolding for energy drink day. I'm stalling a little bit because I'm nervous about drinking this. If you ever see me in person, ask me to tell you my story about a guy who went blind after drinking his home stilled liquor. It's actually MUCH funnier than it sounds. It was delicious! I've got five more packets to use, and I think that there's a bottle of Ocean Spray CranApple out there calling my name. I guess you finished it. When you got closer to the bottom, did you start enjoying the taste and texture of yeast silt? The reaction is pretty straightforward. In an oxygen-free system, yeast eats sugar and craps ethanol. "Care for a glass-a-poo?" My buddy and I did something similar in high school. Fruit juice + yeast + extra sugar (to spike the proof) + an airlock we rigged by running a sportsbottle's straw over to a water-filled beer bottle + time = filthy tasting drunkyjuice and two-day headaches. And yet we persisted. Between that and pressing on each others' carotids until we'd spin out, I guess we did what it took to catch a buzz as long as it required a science book and had a vague, DIY, 3-2-1 Contact aesthetic. At the time I thought I convinced my Dad that my still was a "bacteria clock." "Yeah, you see, if you calibrate the gas reaction correctly the mixture will produce a bubble/second." Never mind that we didn't have a display that captured how many bubbles had elapsed. Also, my Dad was an Army company commander, responsible for the day-to-day management of 150 aggressive, well-trained, alcohol and female-deprived young men in their late teens and early 20s. Looking back now I'm fairly certain the wry smile on his face while I explained my contraption wasn't "My boy, teen genius," so much as it was "My boy, baby bootlegger." Hindsight being 20/20. Also, as much as you enjoy comments, it's a two way street. Your comment re: Lenny Bruce and the band made my whole damn month. I made it about halfway through before I got pretty sleepy and needed to hang it up for the night. I like your story, too, and the whole better living through chemistry, nerds always find a way ethos of it. THat smirk and chuckle still makes me giggle! You KNOW Danny is up to no good! Danny, did you ever try that potato mash bootleg alcohol Dale had? Man, that stuff was knock-you-down powerful and extremely nasty. But we drank it anyway. There's something about the forbidden, even when it's terrible, you still go for it. I remember hearing about that stuff from you guys, but I think I'd already graduated by then. I remember the homemade wine that Nick's parents brought to Dale and Emily's wedding, though, and that was significantly better than this stuff.